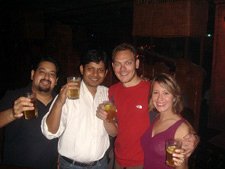 Nuts on Bents Blog » Blog Archive » Day 173: Last night in India! Day 173: Last night in India! From the bar we moved on to a nightclub at the Sheraton hotel – where we met two Brits who were enjoying themselves on company account (and invited our group to join them too!). We danced the night away like two maniacs on speed until the early morning!! Next day we bid our farewells to the Boses (and Scooby the leg-humper) and made our way to the airport. Thankfully Thai Air were surprisingly relaxed about the bicycles, which were just wheeled over to the plane with no hassle for us!